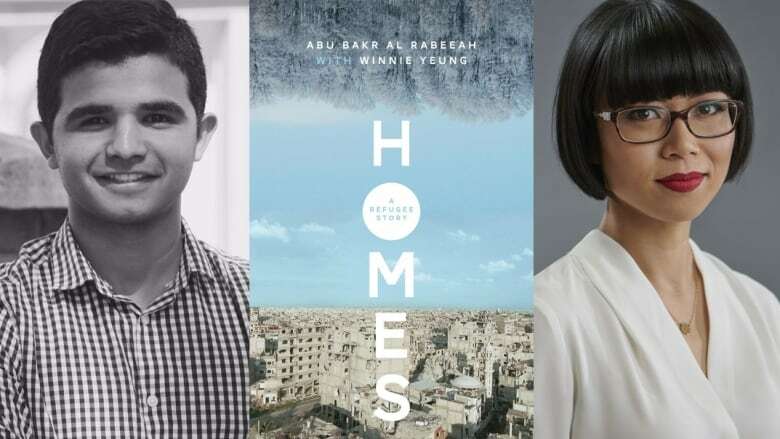 Abu Bakr al Rabeeah's memoir Homes, co-authored by Winnie Yeung, will be defended by Chuck Comeau on Canada Reads 2019. In his memoir Homes, 15-year-old Abu Bakr al Rabeeah recounts what it was like to spend his childhood in the middle of a civil war. Though he witnessed tremendous violence in Homs, Syria, once finding and burying a stranger's jawbone, he was also surrounded by the love of a big tight-knit family — his parents, two brothers, five sisters, grandmother, several uncles and aunts, not to mention the brotherhood of cousins he played soccer and video games with almost every day. Al Rabeeah has called Edmonton home since arriving as a refugee in 2014. When he told his ESL teacher Winnie Yeung that he wanted to share his story to help others, she agreed to help. Over a series of interviews, the two created a book together and was a finalist for the Governor General's Literary Award for nonfiction. Homes will be defended by Chuck Comeau on Canada Reads 2019. Below, al Rabeeah and Yeung discuss writing Homes. "[Sharing my stories] was a great experience. Nothing was really hard for me. It wasn't like reliving hard times or hard memories. It was just telling about my past. I was so proud of it. By telling stories to Ms. Yeung, I learned a lot of stuff that happened to me that I didn't realize. For example, not being able to go out for soccer or with friends — that taught me how to be a patient person. Not having things I wanted because of the circumstances, that taught me to enjoy the small things I had." Winnie Yeung: "The book isn't just about the war. The book is about family. What I was so inspired by is how this family held together, their resiliency. That's what I wanted to highlight was love and this sense of togetherness that I was so touched by." Winnie Yeung: "The biggest challenge was to tell a story in Abu Bakr's voice. I thought it would be more immediate and more relatable if it was from the personal point of view. But then I realized, 'Oh no, I have to write as a 14-year-old Arabic boy.' That was tough. I knew that by the way Abu Bakr was speaking to me in English that wasn't his true voice because he was struggling with the language. Though I could still get his spirit and his warmth and his energy that way, I still had some weird requests for him. For example, I would ask him to talk to someone on the phone in Arabic, just to hear what he sounded like in his own mother tongue. From that I could capture his rhythm and put it on the page. "There would be times when I was writing a passage and I'd walk it back and go, 'No, no, no. That's how I would explain it and that's how I would talk.' I would think about how Abu Bakr would explain it and try to break it down and write it like that. That was the challenging part." Winnie Yeung: "As a teacher I ask my students to write so much and I forget that it's an exercise in vulnerability. You're putting yourself out there. For me, I had to push through my own fears and insecurities about writing just so that I get through it and literally hand the pages over to Abu Bakr. The thing that I learned the most is just to push through those scary insecure parts in writing. Listening became the thing that I had to learn how to do in terms of trying to listen without my own preconceived notions getting in the way — that was big. As a teacher especially, we're so used to jumping in and offering comfort or offering advice. To be able to just sit back and be quiet and let Abu Bakr tell the story that he needed to, that was hard for me to do. Now I'm realizing that is the best gift that we can give to anyone who's going through any kind of trauma, big or small, just to listen."